The CPD Plumbing Dept has installed a valve on the water hydrant at the center of the park. I am not a plumber, but from my conversation with Mike the plumber from the CPD my understanding is that this is a 3 ft deep freezeless water source that is designed so that the standpipe drains out when the water source is turned off for winter. It was not installed for and it’s not designed for our application – watering dogs! I was assured that it only takes a little pressure on the turnkey to turn off the hydrant, but on Friday, I found that I could not turn off the water source that way at all! So, we leave the hydrant on, control the water flow with the new valve, and hope for the best! We can add the water timer again, but the only one I found in the lock box was jammed up with a broken fitting. I took it home to fix. People are putting poo bags in the sand container. This is not a good thing, and we should probably move the container up by the gates (since it is a trash can…). Perhaps it could be converted to be used as a bona fide trash container near the lock box, but I don’t know if CPD staff would clean it out. We’ll check into this possibility. For some reason, people are taking the combination lock off (‘WOOF’!) and leaving it in the lock box. What’s up with this? Who are ‘people‘? If long term we want to store supplies in the box, like the 1000’s of dog poo bags that we use a year at GBP, it’s going to have to be left securely locked. This has to become practice, or else IMHO we need to put a keyed lock on the lock box sometime this summer. 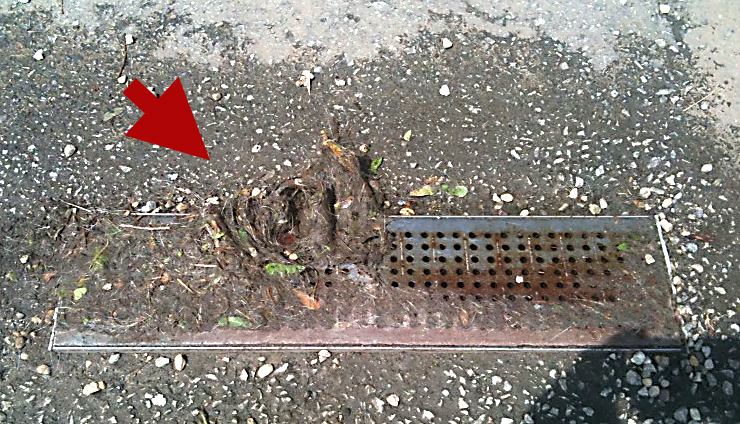 Both of the main drains were completely plugged by accumulated dog hair! Yikes! I found that the best way to get this up was to use a poo bag to scrape it up and then toss it in the trash. This is a task listed in the ‘Got A Minute‘ flyer, but clearly people at the park don’t ‘have much time’ for this – we’re going to need to come up with a better way to communicate the need to take care of this on an ongoing basis.